Street Fighter has traditionally been a 2D fighter. Capcom has traditionally been a 2D fighting game company. That is, until Street Fighter IV. 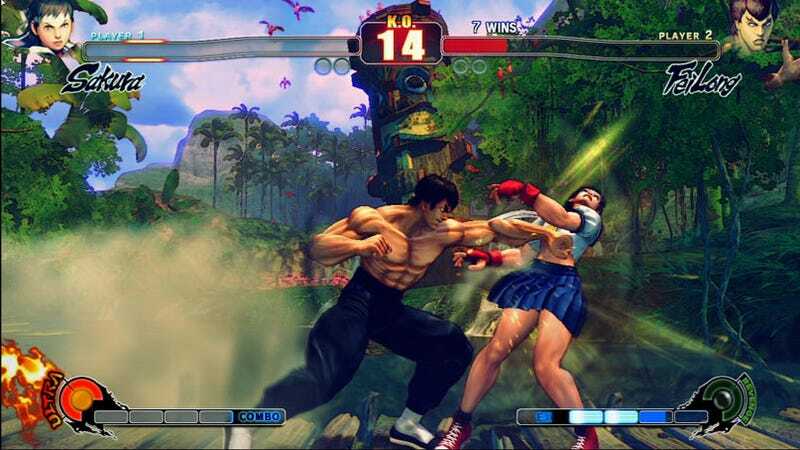 In a break from the previous Capcom developed titles, Street Fighter IV introduced the venerable series to 2.5D. It's somewhere in the middle — not exactly 2D and not exactly 3D. "The 3D models on a 2D plane is a very good match and all of the (game) systems are capable of supporting such a feature," Capcom producer Ryota Niitsuma told Kotaku in a recent interview. Niitsuma is heading up Tatsunoko vs. Capcom: Ultimate All-Stars, a title that like Street Fighter IV uses 2.5D. SFIV received applause and criticism for it being in 2.5D and not pure 2D. With titles like BlazBlue and Melty Blood, there has been a renaissance in 2D fighters recently. Sadly, Street Fighter IV is not apart of that renaissance. But Capcom has moved on from 2D now that it has found 2.5D — unlike 2D, which is viewed by some players as looking "old", 2.5D still looks modern. To appeal to new fighting game fans, 2.5D is ideal as 2D could be viewed as dated by someone who does not fully appreciate the dynamics it has to offer. Niitsuma stated that it is his goal to draw in new players. Continuing, Niitsuma added, "Going out into the future I can't say it will remain like this forever, but for the forseeable future I can see us making our games in this style." This could be read as saying Capcom is out of the 2D fighting game business, but this statement is too wishy-washy. It's not clear. It's vague. And like 2.5D, it's somewhere between "We're only making 2.5D fighters" and "We're not only making 2.5D fighters". It's safe to assume, however, that now that Capcom has the internal software to run fighting games on 2.5D, that we'll be seeing more fighting games in 2.5D. We probably will. And that's fine. But it will be a damn shame if we do not see any 2D fighters will that. It's not a matter of which is better or even personal preferences. As a game genre, 2D fighting is a valuable genre, and 2D and 2.5D are different. They are not the same, and should not be viewed as such. (2.7D is actually a more accurate description than 2.5D as its closer to 3D than 2D.) If Capcom, let's say, begins making only 2.5D, err 2.7D, fighting games, that is one less weapon in its arsenal. "I think at Capcom one of our specialties is 2D fighting action and we have had a great history of making games like that," Niitsuma said. Agreed. So do what you do best and make more 2D fighting games.